THIS THREAD is used to discuss about SPOILERS. In other words, if you only read the English version and wish to wait for the full release instead of getting spoiled, this is NOT the right place for you! 1. Any kind of spoiler involving the case (pictures, texts, information, full scans...) of any language that is released before the English version must be posted HERE. The English translations of the spoilers must also be posted here. 2. Any kind of discussion involving the spoilers must be posted HERE. 3. Despite being a spoiler-only thread, EVERY spoiler and discussion involving events that have not happened in the English releases STILL has to be put inside Spoiler boxes. When the file in question is fully released in English, this is not necessary anymore. 4. NO DIRECT LINK to any Japanese scans (RAWs) or English scans (Japanese spoiler pictures are allowed as long as the amount and quality of which are very far away from a full scan, like the ones we usually have). 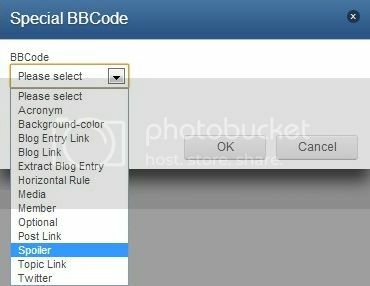 Step 1: Click the "Special BBCode" icon at the upper-left side of the edit toolbar. Step 2: In BBCode, select "Spoiler". Step 3: Enter the text that you want to put inside Spoiler boxes, then click OK. The new character is a phantom thief who's recently been active in Las Vegas. His codename is "Kaitou Corbeau" (with Corbeau being crow/raven in French). The old guy with monocle comes to Japan to hunt this guy (not Kid). I would have loved to see Akako play a role in this; too bad she won't be. Sigh, I'll have to wait a few weeks to see her animated then. My Chinese isn't good enough to help translate the entire chapter, but if there are any specific pages or speech bubbles, you want to know the translation of, I can help ^^ They were making the heist grounds really cold because the old man said that magicians depend on liveliness of their hands to deceive their audience. If it's too cold, they are uncoordinated and more likely to mess up, I'm guessing. I hope this raven guy turns into a legitimate rival or enemy. I'd hate for it to be like the Nightmare/Jack Connery situation that completely resolves in just a few chapters. We'll translate it since we doubt some other group besides a group that also scanlates DC would pick it up. And yes, I'm currently a staff member and a typesetter at Souka Scans. Whew, just read the chapter, and though it's pretty standard and predictable so far, it has potential. The black Kaitou Kid looks badass and Harry is Rum, calling it now. -Corbeau and Toichi actually knew each other. They were fellow apprentices under the same teacher. Corbeau has been sick for quite a while and is only recently active again. He seems to be seeking to avenge Toichi as well. -He makes a wager with Kid. He will steal the heist target using a trick and Kid has to figure it out. If Kid cannot do that, then he must hang up the mantle of Kaitou Kid and disappear. "Kuroba Toichi only needs one legacy." -Harry switched out the jewels at last moment, Corbeau says he will be back to take the real one. -Chikage has heard of Corbeau but doesn't know his relationship with Toichi. She tells Kaito he should quit thieving and go perform in Las Vegas as a career. -Nakamori had a handcuff imprint on his body. And that's basically the chapter! If there are any discrepancies, just say the word. Apologies for such a huge block of text. When on the back of Corbeau's coin signature (or whatever it's called) it says "La prochaine fois je deroberai les vrais" (the next time I will unveil the truths) what is that supposed to mean? Is Corbeau like a detective? Or is he the type that likes to reveal the secret behind magic tricks like Harry, who apparently posts that he "knows how the tricks are done and will prove to anyone who challenges them before every big magic performance. As kkrazy1412 said, this chapter reminded me of a Conan file as well. Not as good as last week's, but still very nice! This case seems really interesting and I can't wait for the third chapter. I love Kaito's grin and Corbeau seems like an interesting character. The last chapter to this arc is out. -Harry had someone install some cold insulation material in the ceilings and walls to retain the coldness of the room. -The feathers are black on one side and white on the other because Corbeau had painted one side to blend in with the ceiling. The cold kept them stuck to the ceiling. When he turned off the ac, the room got warmer and the feathers got blown off by the fan. They speculate that Corbeau had been disguised as the insulation material installer. - Harry had switched out the jewels again. Too bad Corbeau stole the real thing too. Or not since after the police leave, Harry goes to pick up the fake. -TRICK EXPLAINATION (Starring Detective Kaito): The fake is actually the real one. Harry had painted on some oil-based paint on it. If it were fake, the paint would not stay on. When he brought out the real one for examination, he put a fake carved out of ice (it was painted black) back into the case. The case has some type of heater installed. So when everyone was distracted by the feathers, the ice melted and all was left was the coin that had been inside. The black cloth in the case is to hide the melted ice. The inspector had an imprint of handcuffs on his body because of the paint residue. -Kaito asks about Toichi and Corbeau's relation. Snake barges in and so does Corbeau. -The heated case explodes in flames, Corbeau steals Kid's gun, shoots a flaming card and triggers sprinklers. Snake and his goons freeze on the spot. (But escape by leaving their shoes) Hakuba calls this battle a draw. -This was all something planned by Chikage. She was worried about Kaito continuing on as Kid so she wanted to test him. Now that she's appeased, she's going back to Las Vegas. I'm not sure if she was the one who talked to Kaito the other night and saved him this chapter or was this another person though she was working with. Hope someone can clear this up. -The only problem I had was where Harry went and what his relation to this entire thing was. Is he the real Corbeau? -If there are discrepancies or something is unclear, do say so. Thank you very much. I was honestly pleasantly surprised. We got a few small scenes involving Snake as well as Akako, two of the characters that I always have an eye out for in both the manga and anime. I usually can't take MK nearly as seriously as I can DC, but a bunch of major characters have converged for this arc. Apart from major characters, the Organization, Akako, Hakuba, Kaito's mom, and two new characters Harry and Corbeau are all connected to this heist somehow. Not much hype right now, but there's definitely potential for some legit plot development. Copied from the spoiler cbox. I'm told this solution is mostly correct. Maybe the gem was an ice gem with the coin inside, with black dye to make it the right color. It melted due to inductive heating (coin is made of metal) which is why Nakamori also burned his posterior sitting on the column - the metal of his handcuffs heated as well. Nezu chased him off so he wouldn't realize. Naturally Nezu "verified" the fake gem and made the inductive heating element in the column disguised as a death blade spinner. The final chapter (33) has been scanlated! I wish Snake had a bigger role in this arc, though it's nice he and his henchmen appeared. Gosho hasn't forgotten about him after all. And jeez, I had a feeling, but Akako appearing a bit in the previous chapter was just fanservice after all. It was cute having some MK, but I'm more than ready to get back into DC. Despite what Kaito Corbeau says, I think he truly is Toichi Kuroba. He would have wanted to meet his son who has taken up the mantle and the legacy of Kaito Kid while challenging him to see how much he has grown as a magicien and coming back at the same time, knowing the return of Kaito Kid would draw the attention of his assassins. That would explain what Chikage would have done for so long in Las Vegas, finding Toichi hiding himself from his assassins for several years and helping him becoming Kaito Corbeau while he poses himself as the old detective in public (I don't believe for a second her "nice man" is someone else than Toichi Kuroba himself). Toichi would just be doing the same "I can be anyone you know" trick Kaito has done previously to cover his identity while it was a lie. Wait what? MK isn't over yet? I'll only forgive Gosho if it's about Akako or the Organization.